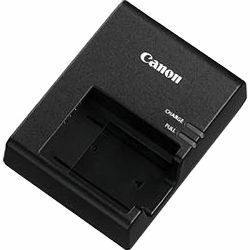 The Canon LC-E10 Battery Charger for EOS Rebel T3 is a replacement battery charger for the unit that comes with the EOS Rebel T3 camera. The LC-E10 charges the LP-E10 Li-ion battery pack that comes with the Rebel T3. Flip-out plug located on back of charger.